When I was in elementary school, my best friend lived just a few houses away. Although we were a year apart in age, we were thick as thieves, walking to school together and playing often in the afternoons either at her house or at mine. We even attended day camp together for a number of summers. This friend and I had a ritual where we would call each other on Christmas late in the morning to tell each other what we found under our respective trees. One year during this conversation, my friend announced she was going to the sleep away camp, Se-Sa-Ma-Ca the following summer. That must have been one of her Christmas presents but I can’t recall. Not one to be left in the dust, I hung up the phone and immediately asked my parents if I too could attend sleep away camp, preferably with my friend. Without skipping a beat, my mother said that yes of course I could go to sleep away camp, and that camp’s name was Waukeela. Um, ok.
What I came to realize as a parent when we chose to also send our girls to Waukeela is that the familiar can be the most important variable in making the decision to hand your children over to another adult’s care for 2-4-6-8 weeks. My mother had attended Waukeela as a camper and worked there as a tennis counselor. Her familiarity with the program and the people, some of whom were still spending their summers there, cemented her choice for me. A brochure arrived quickly thereafter, a young woman doing the most beautiful swan dive off the camp’s iconic tower gracing its cover. That woman would end up being one of my many role models as it turned out. A firm advocate of all-female educational opportunities, my mother was excited for me to attend Waukeela as she knew what I would draw from the experience. I was 12 when I first stepped onto Waukeela’s well trodden campus, carpeted with pine needles from the majestic trees that were the camp’s official mascot. Those same trees had extensive roots that protruded from the ground, taunting campers to navigate them carefully lest they end up in a face plant. Over the years, the feet grew to know where to place themselves on any given path to avoid injury. The age of 12 was actually relatively old to begin a camping experience in those days, although I was still considered a junior and there were plenty of new girls who joined alongside me that year. But, friendships had been established and cliques had been formed and it was clear that I was going to have to put in my time in order to even have a hope of fitting in. The first few weeks were the most difficult as I adjusted to living away from home and shared a cabin with 7 other girls and a counselor. I was homesick, but eventually adjusted thanks in large part to some incredible adults who took the time to help me. Camp was humbling because I was a beginner at just about everything while many of my peers were lightyears ahead either through experience or natural athletic or artistic abilities. I had planned to stay for just the first session which was 4 weeks, but it was clear that the “real” campers either came second session, or stayed for the entire 8 weeks. So on Parent’s Weekend, I asked my parents if it would be possible for me to stay for the second session and they said yes. Six years later, I never once looked back. I was a camper, CIT and waterfront counselor and loved almost every minute. Attending Waukeela may have been one of the important experiences of my lifetime. It would be impossible to list all of life’s lessons one can learn under the pine trees at a small New Hampshire “camp for girls”, but if you either attended camp yourself or know someone who did then you probably know what I mean. 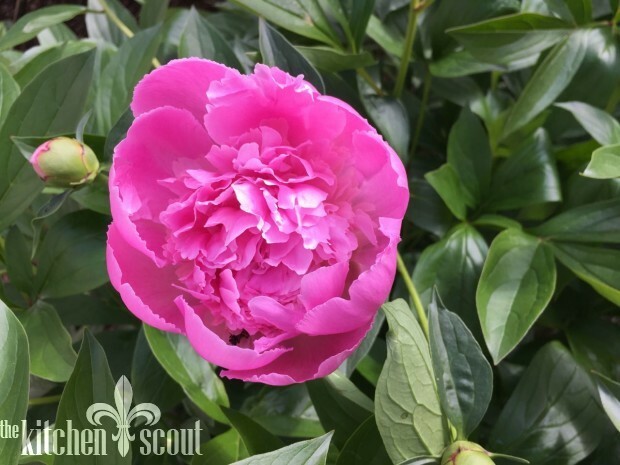 I am grateful that I shared this experience with my mother, my cousins who followed me to camp and my daughters, one who attended enthusiastically and the other not so much to be honest although she did find a different camp she loved. Why am I writing about Waukeela? On the last evening of camp, we would celebrate the summer with an elaborate Banquet with a capital B. The entire dining hall was transformed with murals painted over the course of the summer by the counselors, following a theme that would remind campers that childhood is to be celebrated. Awards were given out, songs of appreciation and farewell were sung and many, many tears were shed. At the end of Banquet, counselors and campers would exit the dining hall and pick up a small candle boat that was lit. We would navigate the dirt pathway that led to the waterfront, a path that we marched every morning to raise the flag, and drop the candle boats into the lake while singing songs and balling our eyes out. We were so sad to be leaving and saying good bye. The knowledge that the moment was over and while we may all gather together the following summer, things would invariably be different. The anticipation and uncertainty of the new year ahead and what it had in store for us. The departure from the safe cocoon we were fortunate to call “home” for 8 weeks, where there was a predictability to our days that started with revelry and ended with taps. The memories we had created, the depths of our friendships and relationships with each other and the staff, the highs and lows from our successes and failures. So yes while we were sad, we were experiencing so many other emotions that were only able to be expressed in the moment with an avalanche of tears. This memory popped into my head this week as I have watched many of my friends return home to empty nests or begin navigating the path after a parent’s death. I think there is something shared among all of these experiences and the tearful moments found in saying goodbye. It may not be as neat and tidy as Dr. Seuss suggests when he wrote, “Don’t cry because it’s over, Smile because it happened”. But, it’s food for thought as we journey through life’s many milestones. Today’s recipe is inspired by one of the last meals I had on our Italian honeymoon 24 years ago. We were nearing the end of our trip and as much as I love Italian food, I was tired of looking at menus and longing for some home cooking. We were in Positano on the Amalfi Coast at a restaurant called Buca di Bacco and I remember asking the waiter if they could make me a pasta with eggplant, plain and simple. I still remember how sublime the dish was, no doubt influenced by the fresh ingredients and the simplicity of its preparation. 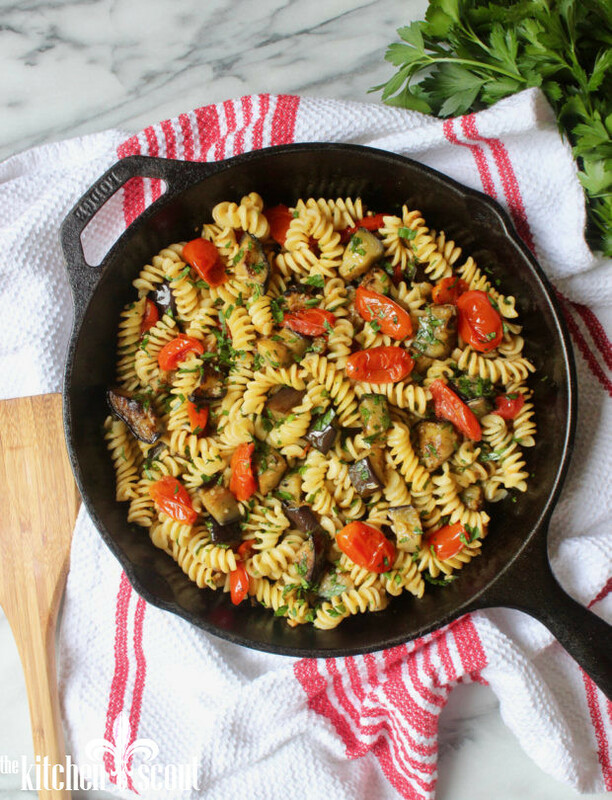 Fusilli pasta was served with chunks of eggplant, some plum tomatoes and parsley. That’s it. I have been trying to recreate this dish and think I may have nailed it with this recipe. If you are a fan of eggplant, I think you will really love it but if you are not, then swap out some zucchini for the eggplant and it will be lovely. And please don’t skimp on the olive oil! I know it will look like a lot, but there it is the primary flavor and moisture element in the dish so it is important. Using a good quality oil is also imperative. 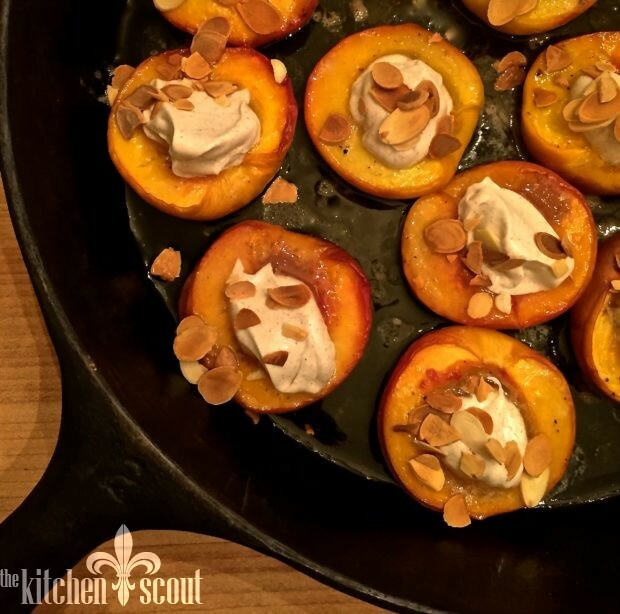 Please let me know if you try out the recipe and what you think! I couldn’t decide if the wooden spatula looked better to the side or under so I am putting both in! This pasta is a simple dish, using just a handful of seasonal ingredients. Use the best quality olive oil you can as it plays an important role in finishing the dish. As for the tablespoon of butter, you can add it in or leave it out but it will add a little luxuriousness and that's never bad! A 12 inch pan is ideal for making this dish, but if you don't have one that big, then you can use a dutch oven to comfortably fit all the pasta at the end of the recipe. In a 12 inch pan (preferably cast iron), warm 5 Tablespoons of the olive oil over medium-high heat. Add the eggplant in one layer and cook, stirring occasionally, until golden brown, about 10 minutes or so. If you don't have a pan that can accommodate all of the eggplant in one layer, then you may want to do this in batches. Remove the eggplant to a plate. Turn the heat off under the pan. Bring a large pot of water to a rolling boil and season with a good handful of salt. Add the pasta and give it a stir. Cook the pasta a minute shorter than the package directions for al dente (about 8 minutes or so). 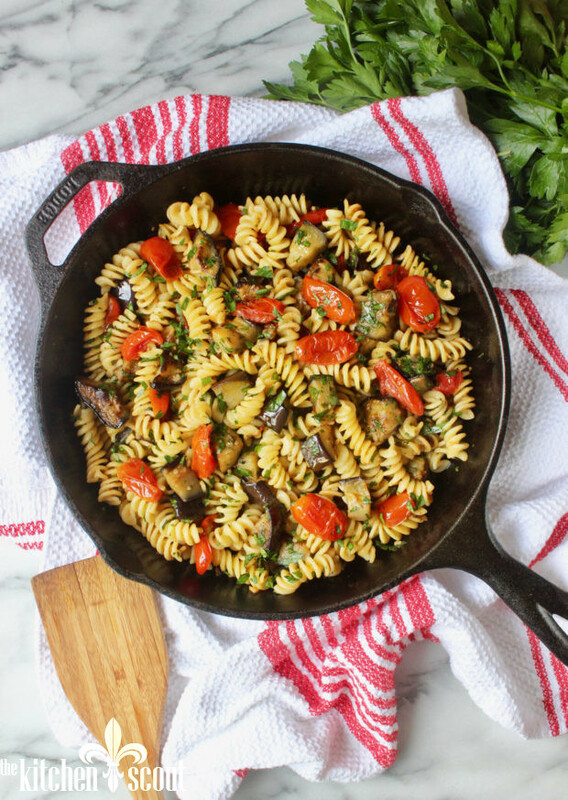 While the pasta is cooking, turn the heat back on in your cast iron pan and add a Tablespoon of olive oil and the cut tomatoes. Cook over medium heat until the tomatoes have softened considerably and then add the garlic, stirring for another minute. Add the eggplant back to the pan and stir until everything is combined. Turn the heat to low. 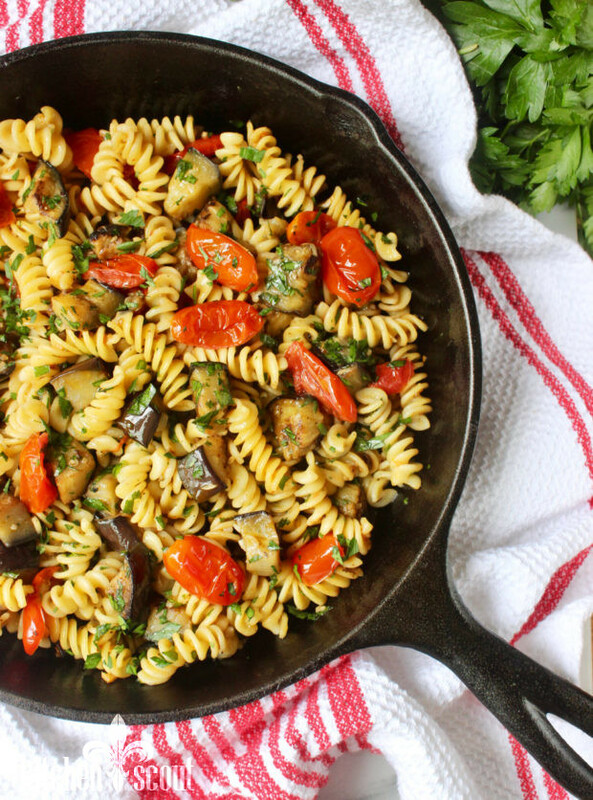 Reserve a 1/2 cup of pasta water and then lift the pasta out of the cooking water and place it directly in the pan with the eggplant and tomatoes and add the pasta water on top. Stir everything together and cook, stirring until the water has evaporated and the pasta has finished cooking. 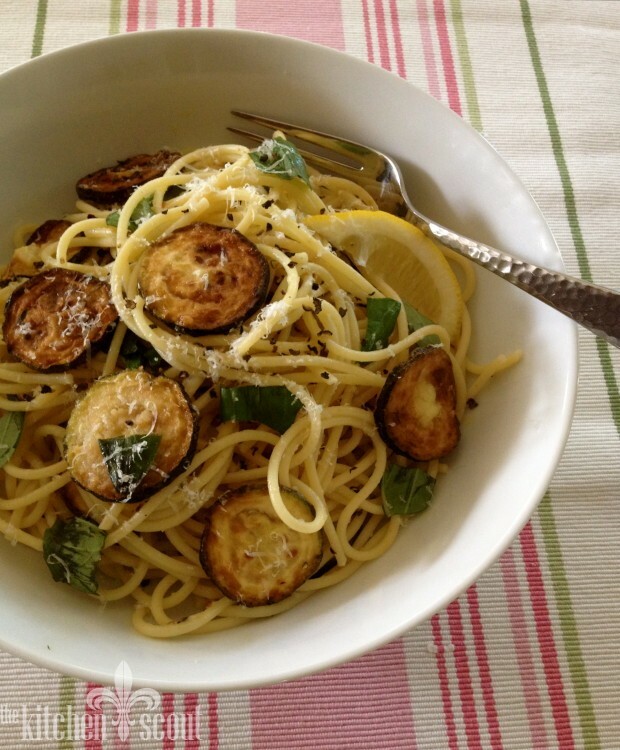 Drizzle the pasta with the last 2 Tablespoons of olive oil and the Tablespoon of butter if using, the chopped parsley, 1 teaspoon of kosher salt and 1/2 teaspoon of freshly ground black pepper and stir until completely combined and the butter melts. Thanks for this beautiful reflection on camp and family and love and goodbyes and new beginnings. Camp has played a huge role in our family too and will always be central to our kids’ identities. Even in college, “camp friends” are among their most cherished. So much is shared and learned along the lake and around the campfires. What a beautiful post, Val. We are a true camp family, as you know. As I navigate two major milestones at once, an empty nest and the death of my beloved father, I am returning to the camp my dad and my boys (and I) loved and shared, for a week of reflection. Thank you for the words to put me in the proper frame of mind.